TULSA, Okla. –– The University of Tulsa women’s golf coach Annie Young announced today that two high school student-athletes signed national letters-of-intent to continue their education and golf careers with the Golden Hurricane. Alex Christeson from Granada High School in Livermore, California and Lilly Thomas from Bentonville High School in Arkansas will join the Tulsa golf team next season. Christeson earned first-team all-EBAL honors, the most competitive league in northern California, for four years. Her accomplishments include winning the Poppy Ridge Classic with a round of 71 and the Helen Lengfeld Tournament by scoring a round of 74, both victories coming in her junior season. Christeson placed second at the Poppy Ridge Classic as a senior with another score of 71. Thomas led her prep team to the Arkansas Class 6A state championship in each of the last two years. Last season, Thomas tied for first-place at the ASGA Overall Golf Championship before losing in a playoff. An all-state performer for three years, she captured individual medalist honors at the conference championship tournaments in 2017 and 2018. Thomas did not begin playing Junior Golf competitively until 2015 and has enjoyed recent success. She placed first at the OJGT/TJGT Red River Shootout in 2018, while finishing in third-place at the ASGA Chenal Junior Invitational. Thomas recorded a low round of 8-under par 64 in a highs school match at the Bella Vista Country Club. 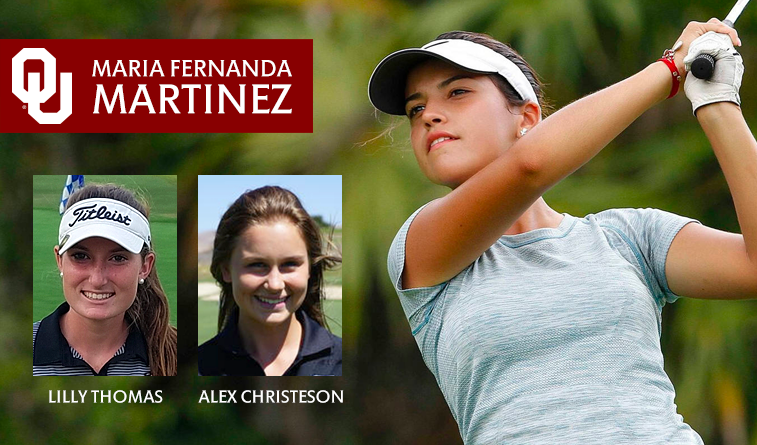 NORMAN – Oklahoma women’s golf head coach Veronique Drouin-Luttrell announced Thursday the signing of Maria Fernanda Martinez to a national letter of intent. Hailing from Alvarado, Mexico, Martinez is expected to enroll at Oklahoma in January 2019. A member of the Mexican National team, Martinez is coming off a summer that included a third-place finish in the 2018 Mexican Women’s Amateur and an 11th-place showing at the Youth Olympic Games in Argentina. She has qualified for the US Girls Junior Championship in 2015, 2016 and 2018 and claimed 33rd in the 2018 edition.